Reporters from BuzzFeed News, The Los Angeles Times, and POLITICO were also not allowed to enter the briefing. Reporters from select outlets that have been critical of the Trump administration were denied access to a press briefing on Friday, Washington Post reports. 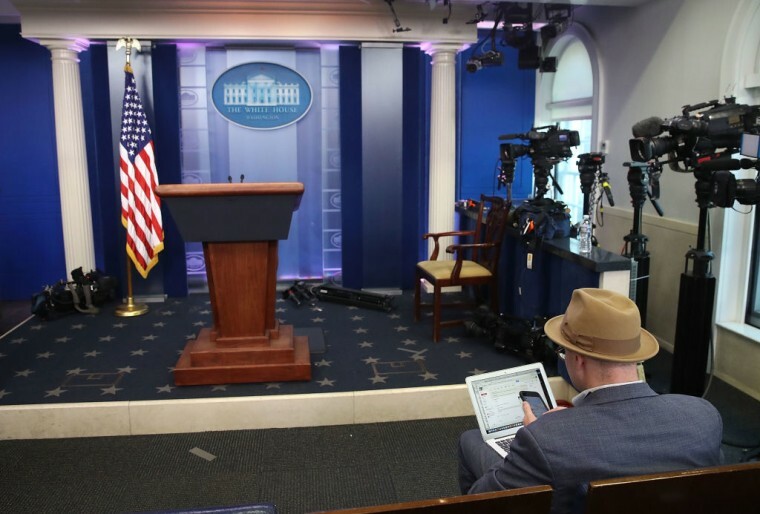 Journalists from The New York Times, BuzzFeed News, The Los Angeles Times, POLITICO, were denied entry to the briefing in an unprecedented move by the White House. The small-group briefing, referred to as a gaggle, was less-formal than a usual press conference and was scheduled as a no-camera event. However, these small-group briefings are usually attended by at least one member of each news outlet and those who have been allowed to attend have never been handpicked by the White House. Only a handful of press outlets were allowed into the press briefing by press secretary Sean Spicer's aides, including conservative news outlets Breitbart News, the One America News Network, and The Washington Times. Reporters from ABC, CBS, The Wall Street Journal, Bloomberg, and Fox News also attended, while journalists from TIME magazine and the Associated Press sat out of the briefing to protest. The denial of journalists from the press briefing came hours after Trump harshly criticized the press in his speech at the Conservative Political Action Conference. The president referred to news outlets as "dishonest" and characterized them as "fake news."